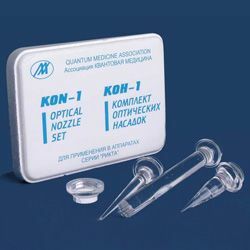 "KON - 1" is the set of nozzles which is applied with apparatuses of quantum therapy of Rikta series. - And for professional doctors. 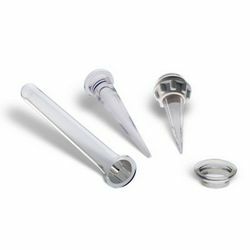 Nozzles are made of nontoxic optical-organic fiberglass. All nozzles have polished surface. It helps to exclude any possibility of trauma and to reduce side radiation. The set of nozzles includes 4 optical nozzles. doctors or patients itself but under strict doctor's control. Nozzle 1 - gynecology, proctology, throat. Nozzle 2 - nose, throat, ear, stomatology, acupuncture, reflexology. Nozzle 3 - nose, ear, stomatology, acupuncture, reflexology. Nozzle 4 - cosmetology, acupuncture, reflexology.